Duke Divinity School is just one of the seminaries that sends representatives to meet with pre-seminary students annually. At Huntingdon College, we believe that God has placed a calling on each and every person’s life. Huntingdon College Campus Ministries offers many avenues for exploring what that calling is. This does not mean that all persons who feel called to ministry must explore full-time, or ordained, ministry. As a community of faith, together we discern what it means for each person to be called by God. Huntingdon College Campus Ministries also places an intentional emphasis on helping to equip and to guide individuals who are exploring a calling to full-time, or ordained, ministry. As a College of the United Methodist Church, Huntingdon is uniquely equipped to help students seeking ordination as Elders or Deacons in the United Methodist Church. The Rev. Rhett Butler ’13, Chaplain of the College, is an appointed clergy person of the Alabama-West Florida Annual Conference of the United Methodist Church, and can help to guide individuals who are discerning the calling received from God. 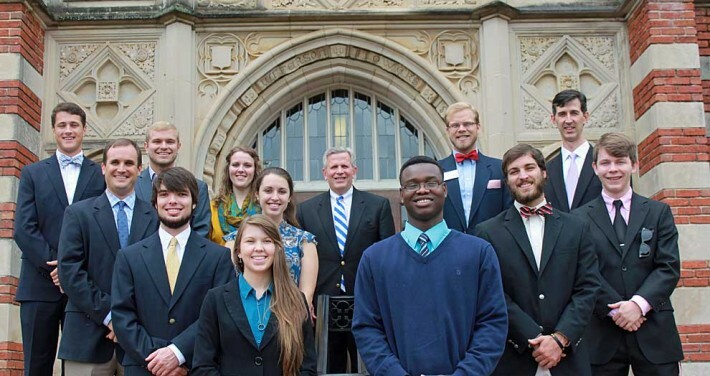 Each year Huntingdon College Campus Ministries partners with the Huntingdon Department of Religion faculty, as well as with local churches, to take students on a tour of divinity schools, seminaries, and schools of theology of the United Methodist Church. Students who may be interested in attending graduate or professional schools in religious disciplines following graduation from Huntingdon are encouraged to take advantage of this trip. Huntingdon College Campus Ministries works with the Center for Career and Vocation and the faculty in the Department of Religion to assist students in gaining professional work experience in local churches. For those discerning a call to ministry, Campus Ministries offers avenues for placing students in work environments where they can gain relevant and enriching experience. Internship opportunities include: youth ministry, pastoral ministry, older adult ministry, children’s ministry, urban ministry, hospital ministry, respite ministry, music ministry (traditional and contemporary), and many more areas.